During the decades-long emigration wave of Mexicans to the United States, Mexico has experienced a wide array of economic, demographic and social changes, some of which undoubtedly have had an impact on Mexican migration trends. This section offers a brief overview of the major changes. Mexico today is the world’s 11th-largest country by population with 115 million people13 and the world’s 11th-largest economy as measured by gross domestic product (World Bank, 2011).14 The World Bank characterizes Mexico as an “upper-middle income economy,” placing it in the same category as Brazil, Turkey, Russia, South Africa and China. Mexico is also the most populous Spanish-speaking country in the world. The most significant demographic change in Mexico in recent decades has been the sharp and ongoing decline in birth rates. 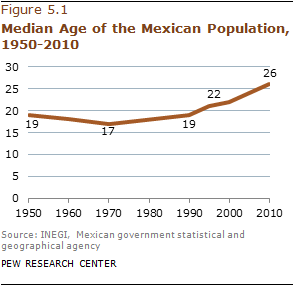 In 1960, the Mexican fertility rate was 7.3 children per woman.15 By 2009, that figure had dropped to 2.4—still a bit higher than the U.S. rate of 2.0 among all women (Pew Hispanic Center, 2011). 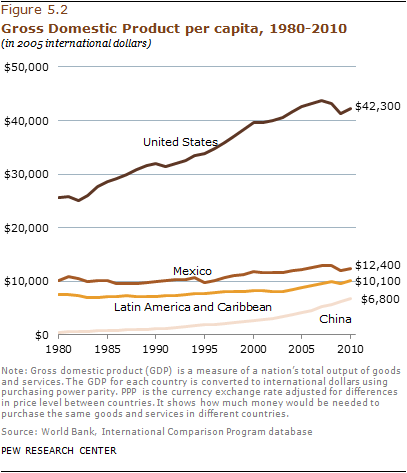 In the three decades from 1980 to 2010, Mexico’s per capita GDP rose by 22%—from $10,238 in 1980 to about $12,400 in 2010.17 This increase is somewhat less than the average for all Latin American/Caribbean countries during the same period (33%) and significantly less than the increase in per capita GDP in the United States during this period (66%). Meantime, during this same period, the per capita GDP in China shot up thirteenfold—from $524 in 1980 to $6,816 in 2010. In more recent years, Mexico’s economy, like that of the United States and other countries, fell into a deep recession in 2007-2009. But since 2010 it has experienced a stronger recovery than has its neighbor to the north; according to INEGI, the Mexican GDP grew by 5.5% in 2010 and 3.9% in 2011, well above the rates in the U.S. for those two years. Despite a moderate long-term rise in per capita GDP, the share of Mexicans who live below the poverty line has not changed significantly in recent decades. It was 51% in 2010, down slightly from 53% in 1984. 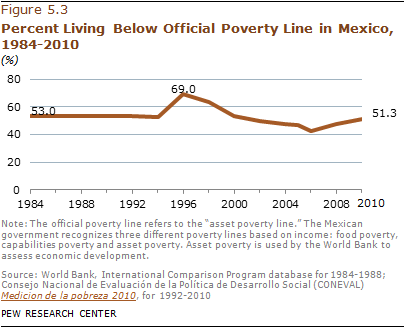 However, that overall stability was interrupted by a major economic crisis and recession in Mexico during the mid-1990s that sent the poverty rate soaring to a peak of 69% in 1996. Another measure of economic well-being that still has not fully recovered from the economic crisis that hit Mexico at the end of 1994 is mean household income. In 2006, the average household income was close to $7,000 MXN per quarter,18 still a slightly lower amount than in 1994. 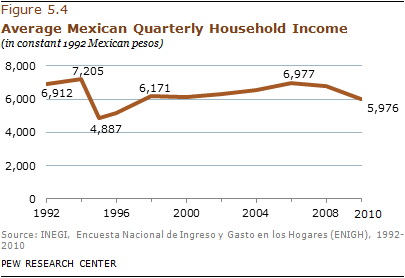 During the recent economic crisis, average household income in Mexico dropped 14% from 2006 to 2010. In terms of health care, almost three-in-five (59%) Mexicans in 2000 lacked health care coverage (CONEVAL, 2010). In 2003, the Mexican federal government created a health care program, Seguro Popular, that provides basic coverage to the uninsured and is free for those living under the poverty line (Comisión Nacional de Protección Social en Salud, 2012). The share of the Mexican population with access to health care had increased from less than half (41%) in 2000 to slightly more than two-thirds (67%) in 2010, an increase of 26 percentage points (CONEVAL, 2010). 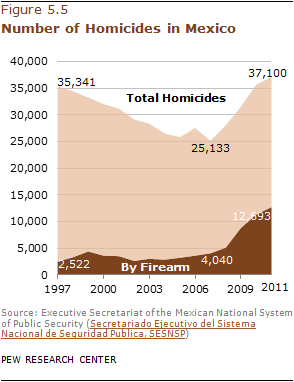 But crime in general, and homicide in particular, is by no means a new problem in Mexico. The number of homicides in 2011 is only slightly higher than the number back in 1997—35,341. Homicide rates fell steadily from the late 1990s through 2005, just as they had around the world, but then, sparked mainly by the drug wars, reversed and began climbing up again. Mexico’s public is very concerned about crime; in surveys taken during the past decade by the Pew Global Attitudes Project, the issue of crime is consistently identified by Mexicans as a top national problem. In a 2011 survey, 80% of respondents said crime was a very big problem, and 77% said the same about drug-related violence (Pew Global Attitudes Project, 2011). The next most serious problems, in the view of the Mexican public, were rising prices (74% said this was a very big problem); illegal drugs (71%); lack of jobs (70%); and the economic situation (69%). In the United States, by contrast, concerns about jobs and the economy far outstrip all other issues in similar surveys about national conditions (Pew People & the Press, 2012). Looking at measures such as employment and GDP growth, Mexico has not been as hard hit by the recent economic downturn as the U.S. Even so, Mexicans have a very pessimistic view of their national economy. According to Consulta Mitofsky, a Mexican survey research group, in 2011, 82% of Mexicans said the economic situation in their country was getting worse, up from 60% who said the same in 2006 and 57% who said so in 2001 (Consulta Mitofsky, 2011). In 2009 and again in 2011, the Pew Global Attitudes survey asked Mexican adults if they would emigrate to the United States if they had the means and opportunity to do so. The results were similar in both surveys. In 2011, 38% of survey respondents said yes, they would migrate to the U.S., while 61% said no, they would not. In 2009, 33% said yes, they would migrate if they could, while 62% said no. Among those who said yes in 2011, a majority (53%) said that they would go to work or live in the U.S. even without legal authorization.